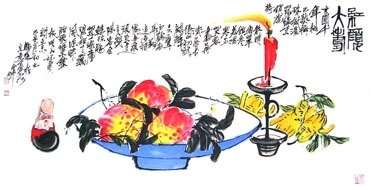 In China, the most important symbolic meaning of peach is the wish for longevity. Peach is praised as "shou tao(寿桃)" and "xian tao(仙桃)", and it is regarded as a magic fruit and offered as a birthday present. Peach blossom is very beautiful and peach is very tasty. Moreover, Chinese ancient people believed that peach had the function of bringing auspiciousness and warding off evil, so peach has deep roots in the folk custom, the religion and the aesthetic standards. In Chinese myth, Queen Mother of the West has a peach garden, the peach in the garden is called "pan tao(蟠桃)". It is said that the peach is blossoming every three-thousands years and fruiting another three-thousands years. The one who eats a magic peach will live six-hundred years more. So peach has the meaning of a long life and worry-free old age. 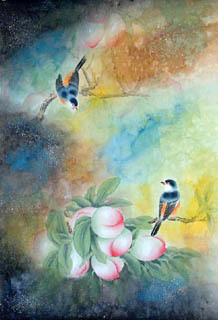 Chinese Bat & Peach Feng Shui Painting: Fu Shou Shuang Quan(福寿双全)/Duo Fu Duo Shou(多福多寿). Peach represents longevity, the bat represents felicity, so they often appear together in a painting and have very anspicious meanings. A peach and a bat, or two peaches and two bats(sometimes there are some other auspicious things in the painting), or a peach and several bats, or a bat and two peaches, these combinations symbolize good blessings for health and longevity. 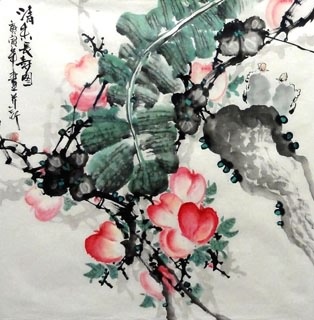 Chinese Child, Peony, Bats and Peach Fengshui Painting: Man Tang Fu Gui(满堂富贵). A child holding a peach, and with peony, bats in the painting. This combination means "Riches and honour fill the home". 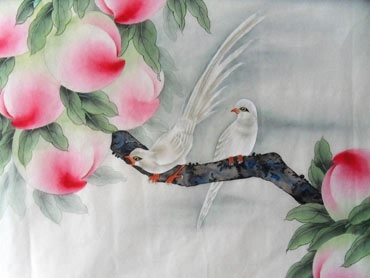 Chinese Cranes & Peach Feng Shui Painting: Shou Tao Wu He(寿桃舞鹤). They both symbolize longevity, so this combination expresses the wish for the healthy, happy and longeval life to the old. Chinese a Bat, a Deer, a Peach and a Character "Happy(喜)" Feng Shui Painting: Fu Lu Shou Xi(福禄寿喜).The bat represents felicity(福), deer represents official's salary(禄), peach represents longevity(寿), and the character "happy(喜)", they constitute a combination 福禄寿喜, which expresses the good wish for the happy, wealthy, longeval and good life. 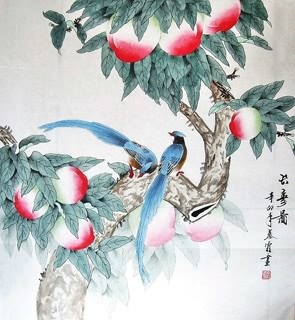 Chinese Peach (a long life) , pomegranate (abundant seeds) and fingered citron(plenty of felicity) Painting: Fu Shou San Duo(福寿三多).This combination symbolizes "living a healthy, happy and longeval life and having prosperous offspring".